Contrary to what most people assume it to be, the job of a clerk is far from being dull. They are a valuable asset to all the organizations as they assist in keeping things organized and work behind the scenes to help in keeping things ticking over. 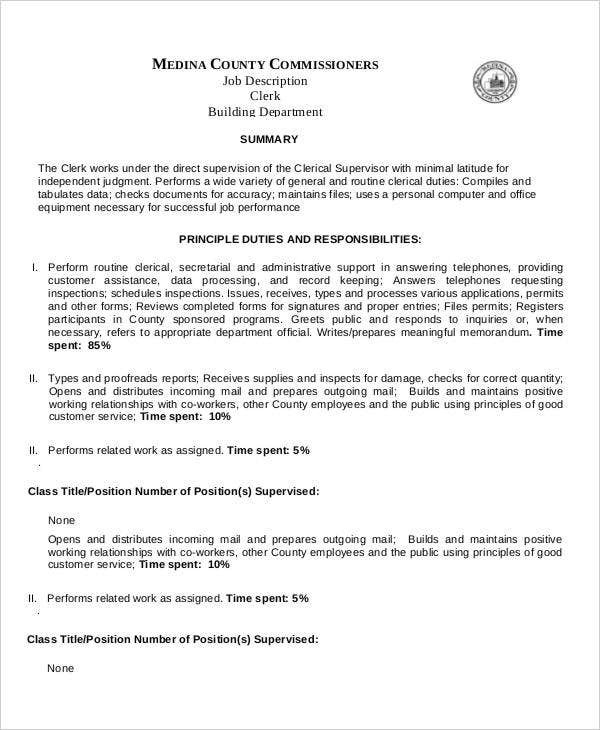 The below-mentioned Sample Clerk Job Description samples will provide you an in-depth analysis of the various roles and responsibilities performed by clerks and they will assist you in crafting the best job descriptions for your organization. 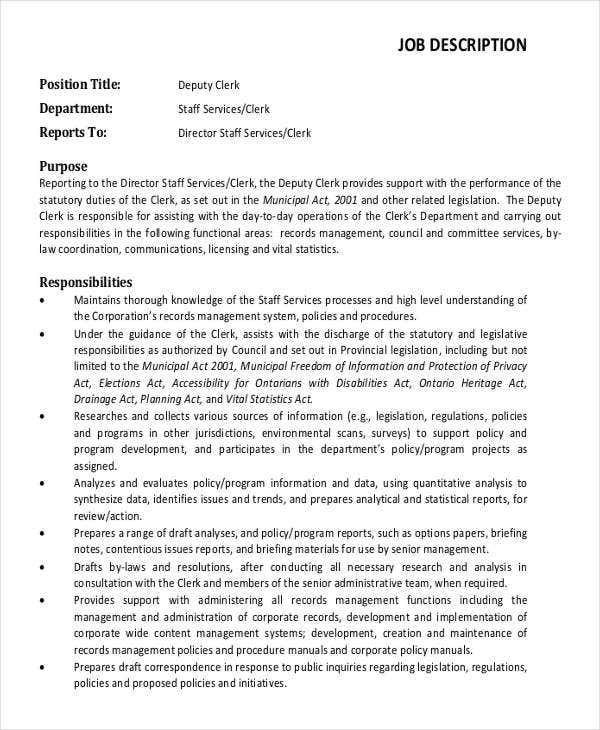 This Administrative Clerk Job Description template will be a perfect choice for you if you are looking for a job description to post the vacancy for the administrative clerk position in job portals. You can use this template as a guideline in preparing yours. 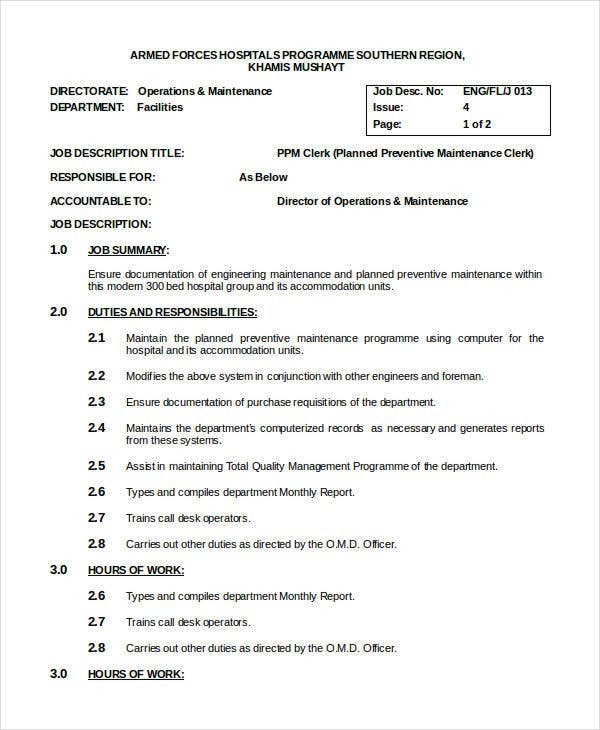 You can also see Administrator Job Description Templates. 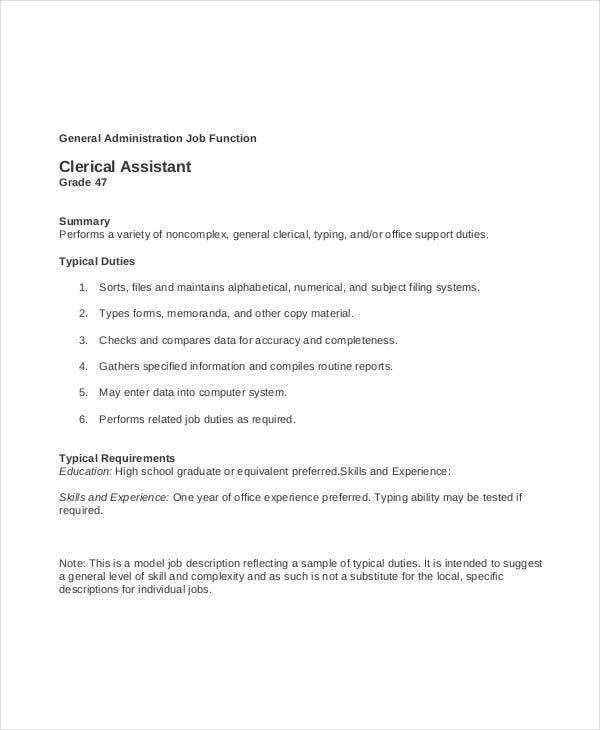 Clerical Assistant Job Description template contains a summary of the job position along with the typical duties and requirements of the job. You can customize the template as per your organization’s need. 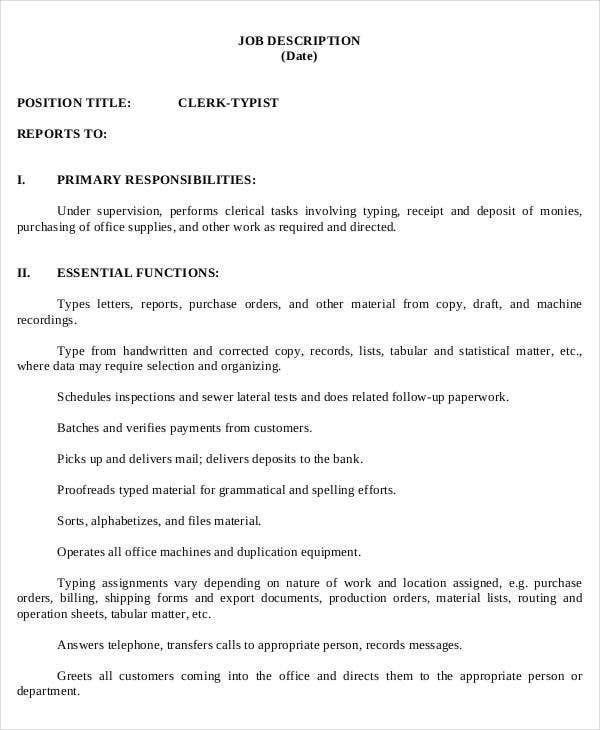 The Clerk Typist Job Description template contains all the essential fields of a job description like the description of the job, essential job functions, examples of work, required knowledge, skills, abilities, educational qualification, training, and experience, along with the needed licensing and certification. 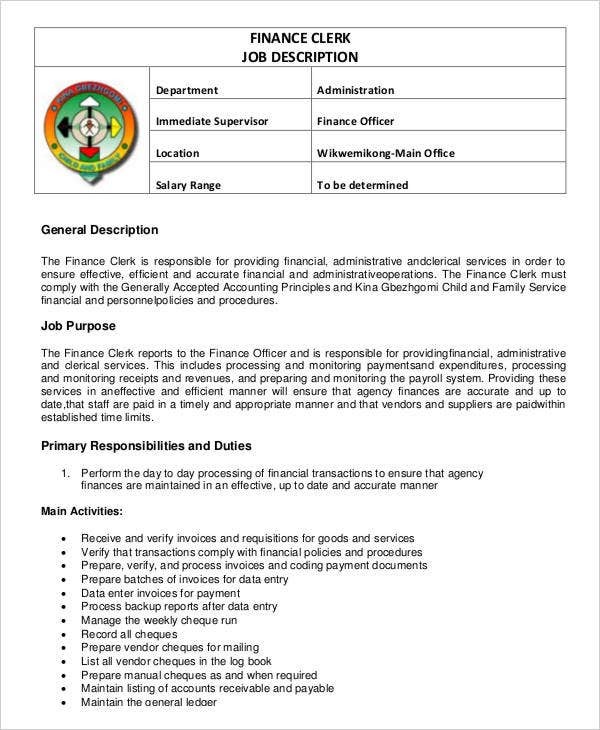 This Finance Clerk Job Description template has fields like a general description of the job position, job purpose, primary responsibilities and duties, main activities, qualifications, and work experience. 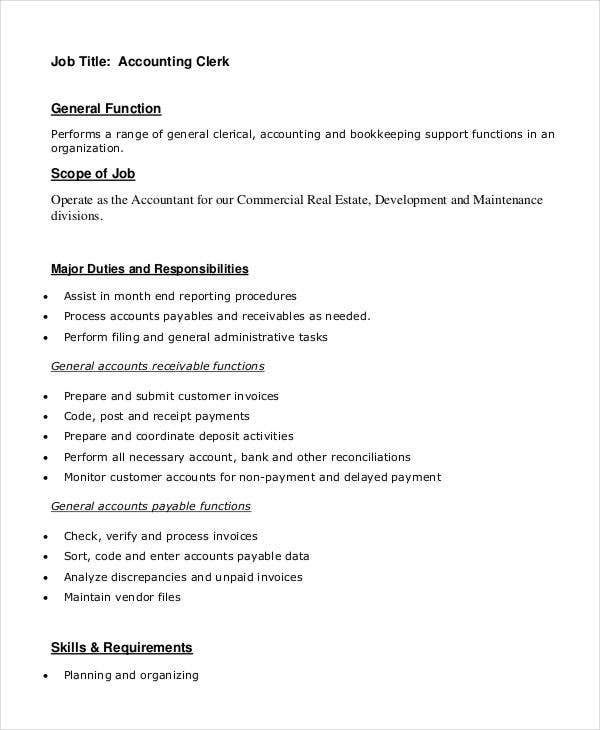 You may also see Accounting Job Description. 1. Why do you need a Job Description? A job description is very critical for any organization to get suitable candidates applying for the job. The recruiters or employers must be particular about the qualification, abilities, or any other specific skill they are looking for and need to mention those in the job description in a word. These job descriptions are also very helpful for the applicants as they help the candidates in being aware of the requirements of the organization so that they don’t apply for a job position where they don’t fulfill the criteria mentioned. 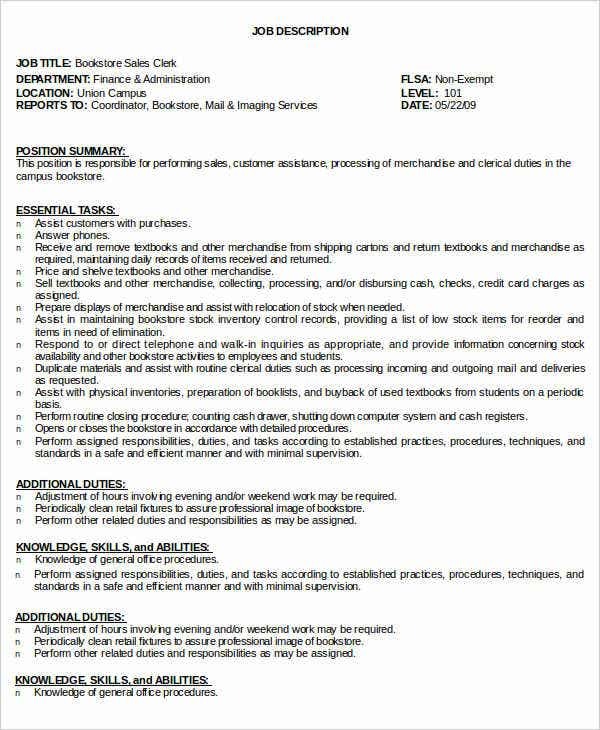 You may also see Waitress Job Description Templates. 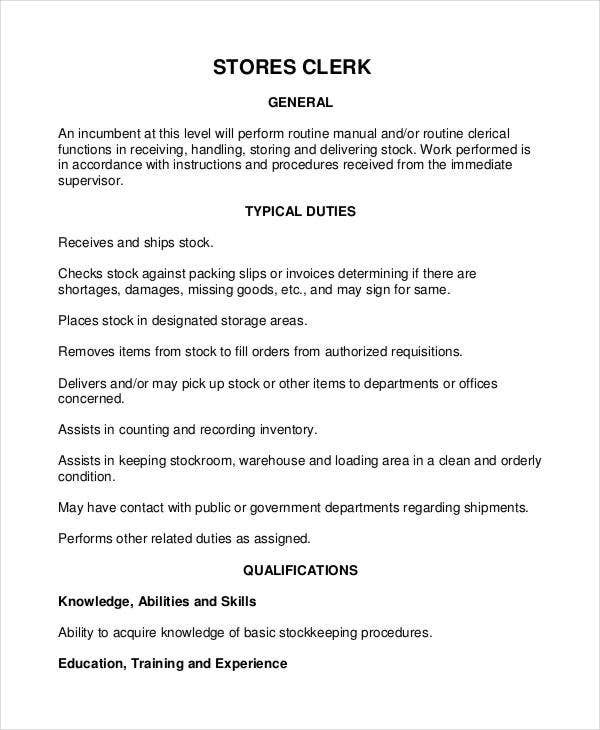 If you are looking for a template to get a proper insight into the job of a stores clerk, you should download this Stores Clerk Job Description template to prepare your job description for the store clerk of your organization. 2. 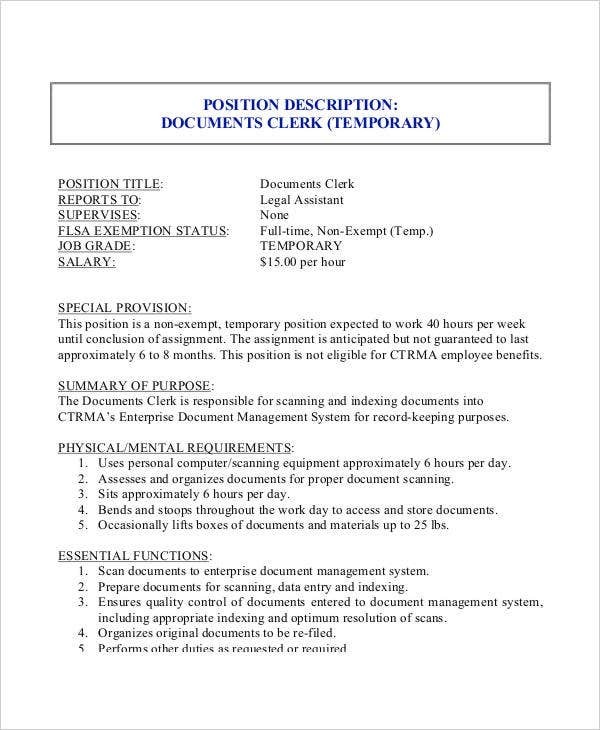 How can you use these Sample Clerk Job Description templates to craft a Job Description? 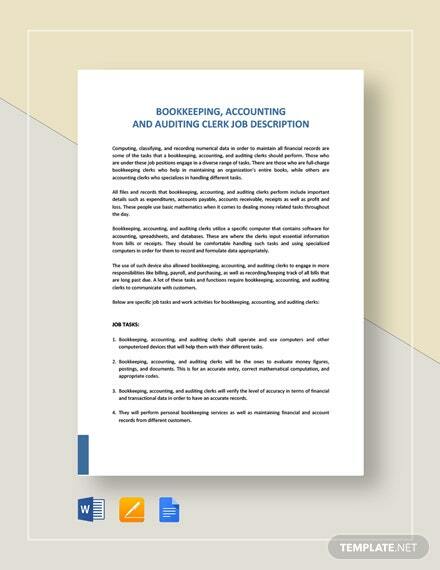 The templates, as mentioned above, are tailor-made for your requirement of hiring a Clerk for your organization. You need to focus on the principals while crafting the job description. You need to provide a detailed description of the specific requirements or skills that the candidate must possess so that you get only the suitable candidates for interview purpose. These templates will provide you with a ready-made structure, and you can customize them if you want to add or remove any particular information. These will save you a lot of time as you don’t have to write a job description from scratch. 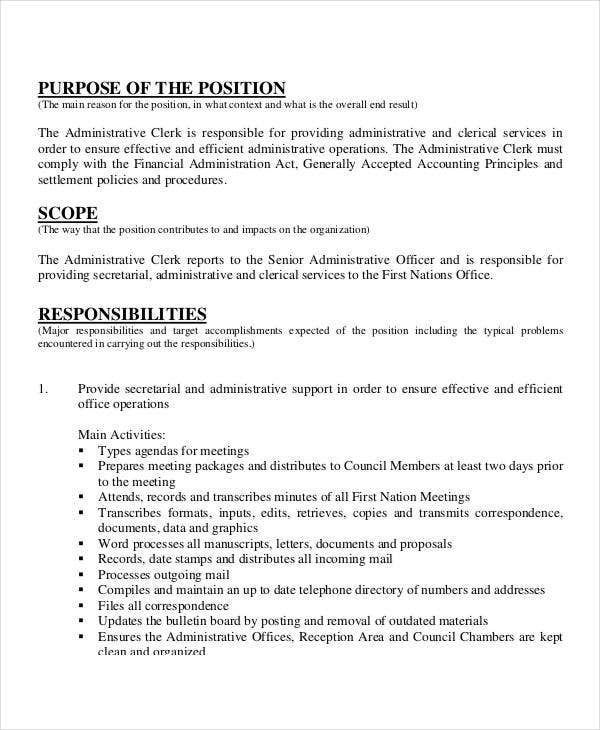 You may also see Manager Job Description. 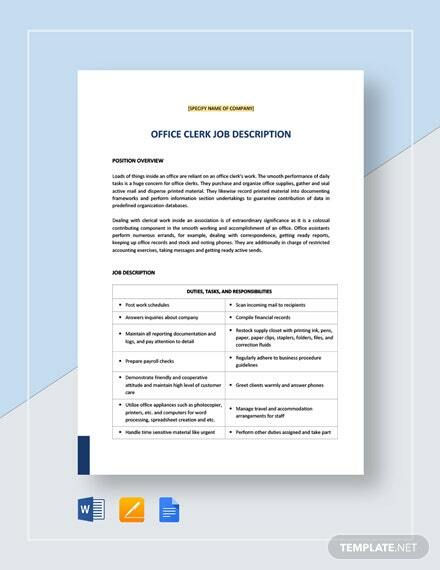 You are in the right place if you are looking for Office Clerk Job Description templates. 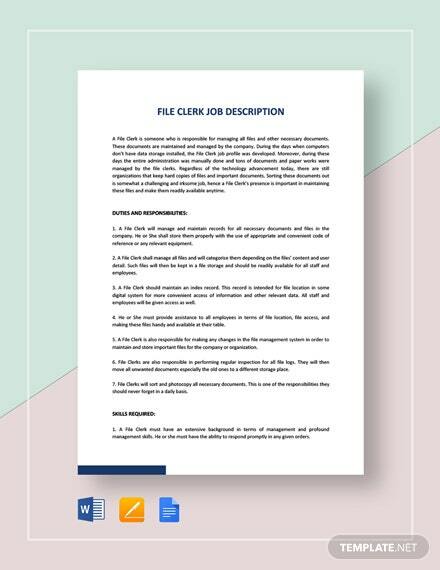 We have a vast collection of Clerk Job Description templates on our website, and you can opt for the one that best matches your requirement of the job description. 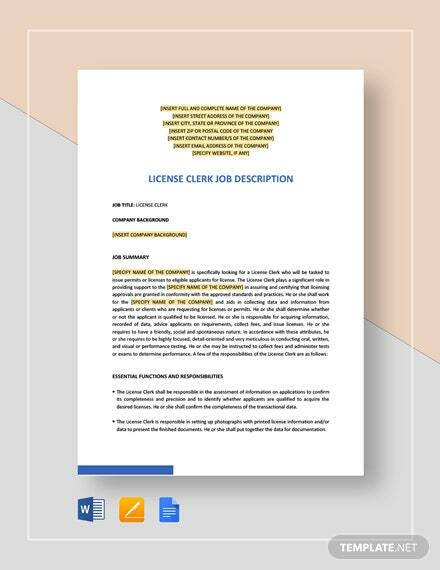 Download the template, customize it, and you will be ready with your Clerk Job Description in a matter of minutes. 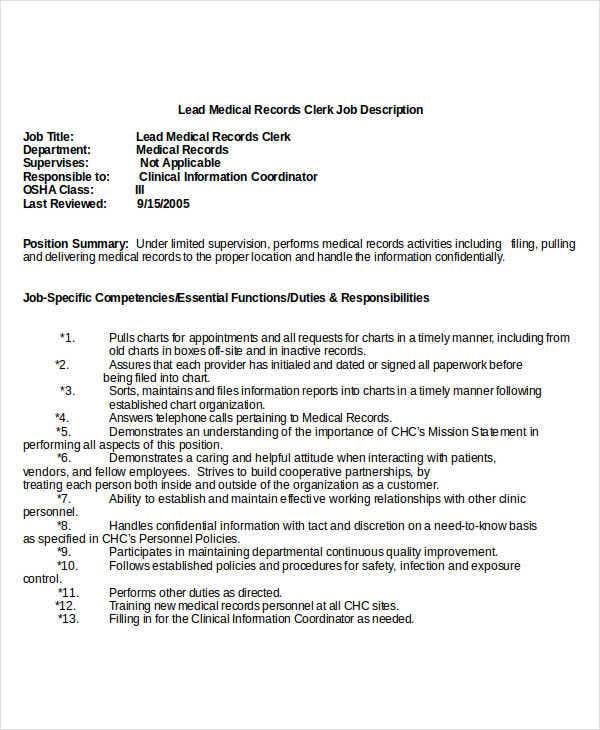 You may also see Data Entry Job Description.